How does a job at Sonos sound? We don’t rest until we get it right. Any time we feel we can make something better, we keep going. We want everything we create to outshine whatever came before, feel truly inspired, and push the edge over what's possible. We treat each other how we want to be treated—with respect and honesty. We value talent from different backgrounds and perspectives, and we strive to promote a culture of respect and inclusion. Sonos provides comfortable, unique, and creative work environments that nurture productivity and fun. Take in the view from our Santa Barbara office. Enjoy a coffee break in the heart of Boston. Collaborate with teams at one of our global offices from London to Shanghai. Our leaders are approachable and involved at every level of the business. We pride ourselves on fostering a community of equals. 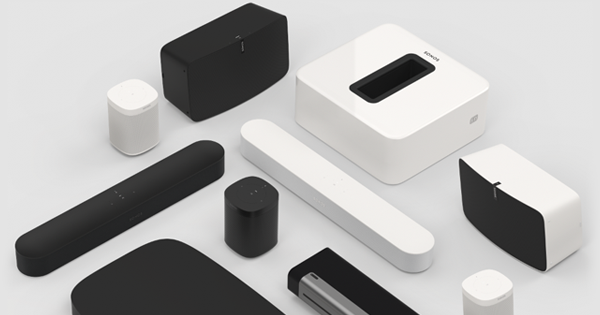 Receive product gifts when you join Sonos and when you reach milestones. Enjoy discounts for you plus friends and family. Full-time employees also get free premium memberships to music streaming services. We want to ensure that our intelligent, creative, and driven employees have fun, engaging spaces where they can thrive. We want our Sonos employees to grow with and within the company, which is why we provide opportunities for them to develop skills in and beyond their role – through global cross-functional collaborations, in-person trainings, and self-directed learning materials. Learn from industry leaders and experts during our monthly Sonos Sessions. Use Zoom or Slack to create forums for open and honest discussions. Sonos Cares gives employees the opportunity to make a difference in the community through paid volunteer time and product donations to charities in need. Our customer care team is devoted to keeping quality sound playing effortlessly throughout the homes of our customers. The sustainable, well-defined processes and systems here at Sonos ensure listeners around the world can receive product support and advice in a quick and efficient manner. The people team works to find, grow, and keep collaborative and dedicated teammates. They shape the culture at Sonos and build a productive, inclusive environment for everyone. After all, Sonos wouldn’t be Sonos without its people. The finance, facilities and legal teams at Sonos ensure that we continue to be a successful and scalable business, built to achieve sustained, long-term growth. Be it through the management of our facilities, or the efficient monitoring of our finance operations, each of these teams is focused on providing effective and efficient solutions to drive our business forward. This team of highly analytical thinkers and creative visionaries bring Sonos to life all over the world through stories and experiences. Working cross-functionally to ensure we build a brand that matters, they develop strategies to optimise profitable growth through our direct digital business, owned retail stores and wholesale partners; devise cutting-edge, award-winning campaigns to coincide with product launches; and support experiences on the ground that showcase the benefits of listening better. Our operations team is responsible for bringing product ideas and designs to life. From production and cost management to launch execution and global logistics, this team plays a crucial role in creating the Sonos product experience. Our platforms and infrastructure team creates and manages systems that enable Sonos to work faster, better, and more efficiently. Focused on improving our capacity, this team devises important solutions and technical capabilities that enable our team to operate successfully. Our product team is united by a shared mission: to deliver the ultimate listening experience. Overseeing our product hardware, system software, integrations, voice control, and user experience, this band of designers and engineers collaborates to tackle diverse technical challenges and help our listeners do more of what they love. We offer a range of student internships and full-time opportunities for new graduates. At Sonos, you are empowered to take charge of your own career, applying your education to innovate boldly and collaborate with some of the greatest in the industry. Begin your career at a place where your voice matters in helping us further our mission to listen and live better. Meet some team members and hear firsthand what it’s like to work at Sonos.